The 2014 XFR-S is a new high-performance sports trim level of the Jaguar XF. With stylish and well-crafted interior, sporty handling, comfortable and refined ride, and a powerful V8 engine, the 2014 Jaguar XFR-S is an exclusivist model at $99,900 MSRP and with just 100 examples that will be sold in U.S. in 2014. 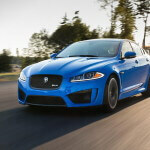 The 2014 Jaguar XFR-S competes with BMW M5, Audi RS 6, Cadillac CTS-V and Mercedes-Benz E63 AMG. The Jaguar XFR-S is a midsize sports sedan that has an attractive design and comes with a wild body kit with oversized central and side air intakes, extended side sills and a rear diffuser constructed from carbon fiber. The interior comes with high-quality materials, dark aluminum trim, carbon leather upholstery with an R-S logo embassed on the seats. Standard features include heated and ventilated sports seat, perforated leather, a heated steering wheel, dual-zone automatic climate control, a sunroof, adaptive headlights with automatic high beams and 16-way adjustable driver seat. A blind-spot monitoring system, a touchscreen navigation system, Bluetooth connectivity and front/rear parking sensors are also standard. The XFR-S comes also with an 825-watt, 17-speaker Meridian surround-sound system with 30GB of music storage space as standard.